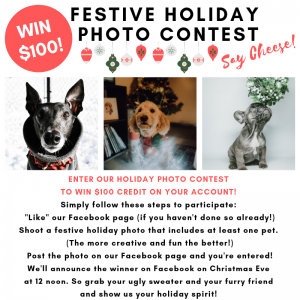 Enter Our Festive Holiday Photo Contest To Win $100!!! Submit your photos by posting them directly to your hospitals Facebook page. The contest starts today Monday, December 10th ,2018 and ends Monday, December 24th ,2018 at 12 noon. The winner will be picked by your hospital team! The selected winners will get $100 credited to their account. The prize cannot be exchanged for cash. Facebook is not affiliated with this contest and that all participants release Facebook from any liability. Participants grant VetnCare full rights and permission to use their photo submissions in future marketing activity. We can't wait to see your photos! Good luck!